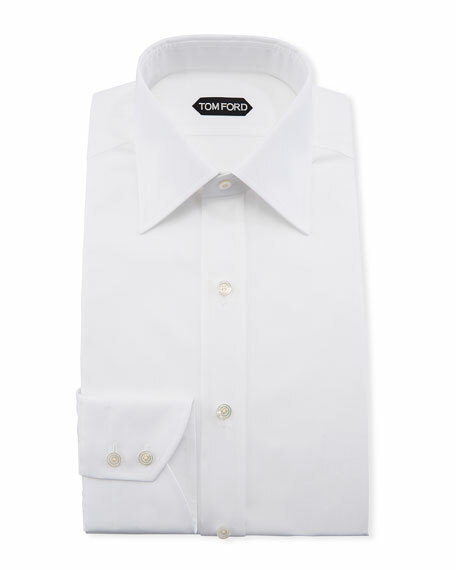 Tom Ford solid dress shirt. EXCLUSIVELY AT NEIMAN MARCUS Brioni end-on-end woven dress shirt. Contrast spread collar; French-placket button front. Contrast French cuffs. Shirttail hem. EXCLUSIVELY AT NEIMAN MARCUS Brioni end-on-end woven dress shirt. Contrast spread collar; French-placket button front. Contrast French cuffs. Shirttail hem. Cotton. Handmade in Italy.